Planning sell your used mobile or get a used mobile at an affordable price? Price and on top of that get extra Rs. 100 added to your selling price on every month. Offer is valid on top brand mobiles like iPhone, OnePlus, Vivo, Samsung, Sony, Oppo & more. Get extra Rs 300 off on cashify app download. Valid for all new users. Use the coupon code to get this discount. Selling mobile phone becomes very easy and efficient with Cashify. Log in to your account fill in important information and sell online. Products like Apple, Samsung, Sony, Nokia, HTC, Motorola, OnePlus, LG, Oppo, Xiaomi, Asus, Blackberry and more. Please read terms and conditions to avail the offer. Coupon/Offer Details: Cashify brings you this great offer. If you are looking for the best online store to sell any of your old and used gadget! Cashify Online Store is the right place. Get Flat Rs 100 Extra on your sold product. Go to the landing page from GrabOn website. Choose the product you want to sell. Apply the given Promo Code on the checkout page to avail the extra amount. This is valid for both Cashify new and old users. It offers the best and cheap services for online repairing. Amazon pay can discontinue or expire the offer anytime without any prior notification. This offer not valid in Cashify Mobile App transactions. Looking for selling your Old Laptop but not finding a decent value in return? Now sell your Used Laptop on Cashify at a price you never thought of + Get Rs 100 Extra. Follow the landing page and add your Laptop's credentials and be assured of the best price on your product. Apply the mentioned Cashify Discount Code and get the Extra Rs 100 added to your amount for FREE. With Cashify you can sell all your used gadgets that include the laptop, mobile, desktop, TV, gaming consoles, tablet, and iMac. This offer is valid on all the products which are listed on the Cashify.in to all users. Cashify brings you an amazing offer that will enable you to upgrade your gaming levels to the next realm. Sell your old gaming console on Cashify and get a handsome cash in return + Get extra Rs 100. Use the given Cashify Offer Code on the checkout page to get the promised free amount. Sell your old & used gaming console now and buy your next gaming console with the amount received in exchange. Now sell your old/used mobiles, laptops, televisions, gaming consoles and other electronics at Cashify. Share the Cashify App along with your unique code to your friends and earn Rs.150 every time your friends transacts. Duplicate the referral connect from the greeting page and offer it with your loved ones today and Earn! Offer substantial for both new and old clients. Now referring to your friends is rewarding so don't wait and start referring and earn Rs.150 cash for each referral. Please read terms and conditions before proceeding to referral. Copy the referral link from the landing page and share it with your friends and family today and Earn! Offer valid for both new and old users. It's time you get rid of your old mobile, laptop or any other old gadgets and upgrade to newest. Thinking how? With Cashify, sell your used electronic devices including mobiles, laptops, Mp3 players, T.V's, tablets, gaming consoles and many more. You don't really need to use any Coupons to get a handsome price on selling your devices at Cashify online portal. Sell your device and gadgets at the best value and upgrade yourself and home with new best trendy devices. This is applicable for all users and is a limited period offer. Now sell any product be it your Mobile Phones, Laptops, Gaming Consoles, etc and get Flat Rs.100 extra on your sold products. Get over your old and used devices today because you have a reason now welcome a new one. Hurry! Copy the given Discount Code and follow the landing page to sell your devices. Choose the device you want to sell from the store on the website and take it to the checkout page. Apply the given Cashify Promo Code at the checkout page to avail the extra pay. No terms and conditions to be met to avail this Deal nor any target to be met. Moto G6 is launching on 4th JUNE and you have old MoTo series but want to buy the new launch? Not To Worry! Sell your old and used MOTO smartphones at Cashify and get a decent amount in exchange. 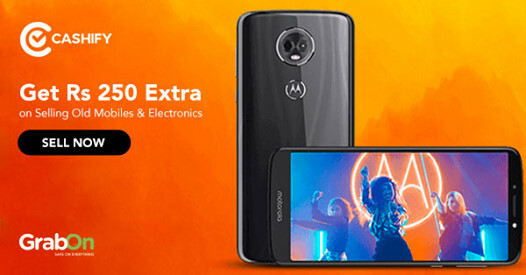 Get extra Rs 200 in exchange for your MoTo smartphones as you apply the given Offers Code. Follow the landing page and sell your MOTO smartphone now. No minimum order value required to avail the discount. This offer is applicable to all old and new MOTO smartphone users. Get this limited period offer today. Get it now. Hurry! Wanting to get rid of the old Television and planning to get a NEW ONE? And the cash will be handed over to you once the proper check has been done while pick-up. Confiremed Today! It's time you get rid of your old mobile, laptop or any other old gadgets and upgrade to newest. Thinking how? With Cashify, sell your used and unwanted electronic devices including mobiles, laptops, Mp3 players, T.V's, gaming consoles, tablets and many more. By not using any Cashify coupons you can avail the lowest price at Cashify on your devices. Sell your device at the best value and upgrade to your new best trendy devices. Follow the landing page for more and more details about the products.Sell now! An extra helping of cash on the quoted amount is always appreciated. Sell your product at the best price using Coupons and Offers from GrabOn. Get that and much more on this regularly updated page from GrabOn. Find Cashify promo code and other exciting offers. The gadgets eligible for sale on Cashify, range from laptops, desktop, Macs, TVs, gaming consoles and mobile phones. Cashify has a simple logic they follow for selling your gadget and getting you the cash. If you are a new user, you can use Cashify first time user Coupons and get additional benefits. Cashify is an online platform that allows you to sell your used or old gadgets without any hassle and at the best price available in the market. With a motto of ‘one man's waste could be another's resource’, Cashify brings the best deals available online straight to your doorsteps. Cashify offers the best deals for your old phone. So, with minimum effort, you get maximum money for the transaction. Offering fast services on the selling of gadgets, Cashify continues to gain mass popularity owing to its excellent customer satisfaction rate and the best customer experience. For starters, you get the price quote instantly after you put the used gadget up for sale and someone shows interest in purchasing the said item. If you are worried about whether your used gadget will get sold or not, don’t be. Cashify assures the sale of the item. A guarantee nonetheless! Urgh! Go somewhere and drop your old phone? You end up wasting so much on transportation. Well, not if you use Cashify. They have a pickup facility. So, your old buddy gets a lift and gets dropped. Hassle-free and no dime wasted. Cashify gives you a 100% guarantee on the privacy of information. You do not need to worry about any transaction detail getting leaked in the process. After the purchase of the gadget from the other end, the cash will be delivered to your doorstep instantly. Cashify deals with the entire process- from engaging with the customer to settling the final payment. You can also use GrabOn Exclusive Coupon Codes on transactions to get additional offers. Phew! You sold that old (but usable) phone and now have a lot of cash to reinvest. Cashify helped you sell the phone but can Cashify do any more? Of course, it can! They maintain a dedicated blog, which talks about the latest gadgets and electronics. Be it the best camera phone, gaming phone or just the usual multipurpose- find all the information you need. They also have comparisons, which gives you a better idea if you are confused between iPhone X vs. Pixel 2. Find many such comparisons, detailed reviews and more, Well, this sounds helpful, doesn’t it? Not just phones though! They write reviews and comparisons about most electronics. Sell Old Phones In 60 Seconds Without Any Hassle! Selling used mobile phones can be a pain in the neck. Figuring out the resale value, finding the right customers and then narrowing it down to one candidate is a lot of trouble to go through. Let's not talk about the wait time involved. Now, Cashify has made it easy for you to sell your old smartphone and that too within 60 seconds. Make use of the Cashify offer and get the best price on your used mobile phone. How To Use Cashify Coupons On GrabOn? Cashify is the place where you can convert your device/gadget into cash, so the name Cashify. Having quite a few devices lying around at your home unused? Get it cashified on this portal. It is the best way to gain free cash by getting rid of your unwanted old devices and electronics. The process of selling your old gadget and getting cash in lieu of it is an extremely easy process. Yes, there are various other ways in which you can do this both online and offline but, what is good about Cashify is that they promise real fast transition, instant cash, and addition to it some extra cash as you use our Cashify Promo Codes and Cashify first time user Coupons. Few of the factors that make them the best in the market are instant quotations, guaranteed sale, fuss-free process, great level of privacy, free pick up of the device and instant delivery of cash at the specified address on your doorstep. Gadgets and Devices that you can sell through this platform are Mobiles, Laptops, Desktops, Tablets, iMac, Gaming Consoles and Televisions. You also get 7 Days money back guarantee plus 6 months warranty along with their services for free along get some extra discount on your repair booking by using our Cashify ScreenPro Coupons available on our page. To unlock the best selling price for your devices plus to get some extra cash and for affordable repair services, get coupons from GrabOn.